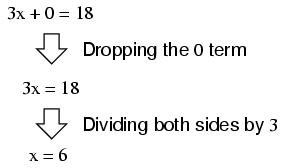 Note: while division by zero is popularly thought to be equal to infinity, this is not technically true. 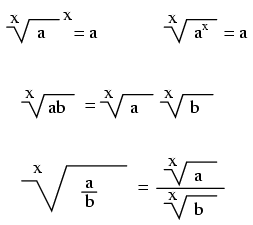 In some practical applications it may be helpful to think the result of such a fraction approaching infinity as the denominator approaches zero (imagine calculating current I=E/R in a circuit with resistance approaching zero -- current would approach infinity), but the actual fraction of anything divided by zero is undefined in the scope of "real" numbers. When people talk of a "square root," they're referring to a radical with a root of 2. This is mathematically equivalent to a number raised to the power of 1/2. 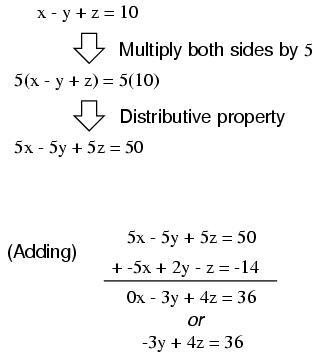 This equivalence is useful to know when using a calculator to determine a strange root. Suppose for example you needed to find the fourth root of a number, but your calculator lacks a "4th root" button or function. If it has a yx function (which any scientific calculator should have), you can find the fourth root by raising that number to the 1/4 power, or x0.25. It is important to remember that when solving for an even root (square root, fourth root, etc.) of any number, there are two valid answers. For example, most people know that the square root of nine is three, but negative three is also a valid answer, since (-3)2 = 9 just as 32 = 9. 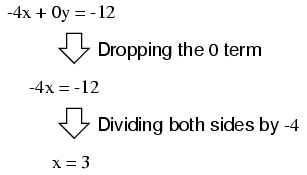 Euler's constant is an important value for exponential functions, especially scientific applications involving decay (such as the decay of a radioactive substance). 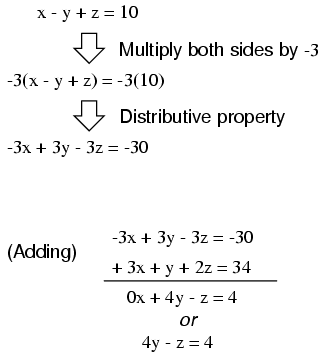 It is especially important in calculus due to its uniquely self-similar properties of integration and differentiation. Pi (π) is defined as the ratio of a circle's circumference to its diameter. Note: For both Euler's constant (e) and pi (π), the spaces shown between each set of five digits have no mathematical significance. They are placed there just to make it easier for your eyes to "piece" the number into five-digit groups when manually copying. 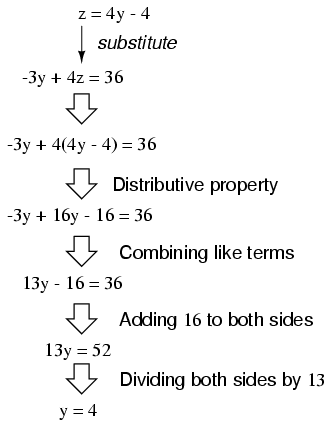 An arithmetic sequence is a series of numbers obtained by adding (or subtracting) the same value with each step. A child's counting sequence (1, 2, 3, 4, . . .) is a simple arithmetic sequence, where the common difference is 1: that is, each adjacent number in the sequence differs by a value of one. An arithmetic sequence counting only even numbers (2, 4, 6, 8, . . .) or only odd numbers (1, 3, 5, 7, 9, . . .) would have a common difference of 2. 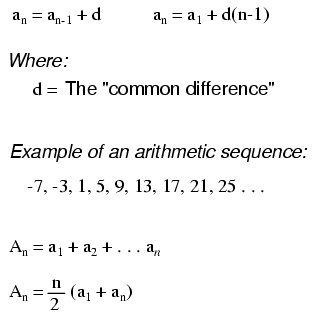 In the standard notation of sequences, a lower-case letter "a" represents an element (a single number) in the sequence. The term "an" refers to the element at the nth step in the sequence. For example, "a3" in an even-counting (common difference = 2) arithmetic sequence starting at 2 would be the number 6, "a" representing 4 and "a1" representing the starting point of the sequence (given in this example as 2). A capital letter "A" represents the sum of an arithmetic sequence. For instance, in the same even-counting sequence starting at 2, A4 is equal to the sum of all elements from a1 through a4, which of course would be 2 + 4 + 6 + 8, or 20. 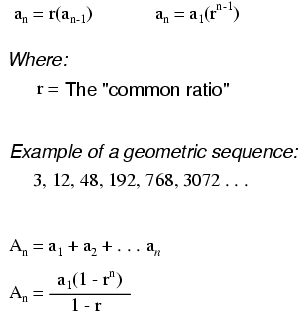 A geometric sequence, on the other hand, is a series of numbers obtained by multiplying (or dividing) by the same value with each step. A binary place-weight sequence (1, 2, 4, 8, 16, 32, 64, . . .) is a simple geometric sequence, where the common ratio is 2: that is, each adjacent number in the sequence differs by a factor of two. Denoted by the symbol "!" 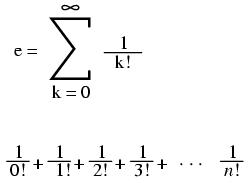 after an integer; the product of that integer and all integers in descent to 1. Each line is actually a continuum of points representing possible x and y solution pairs for each equation. 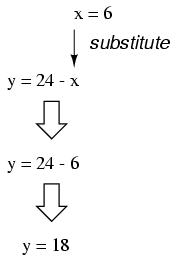 Each equation, separately, has an infinite number of ordered pair (x,y) solutions. 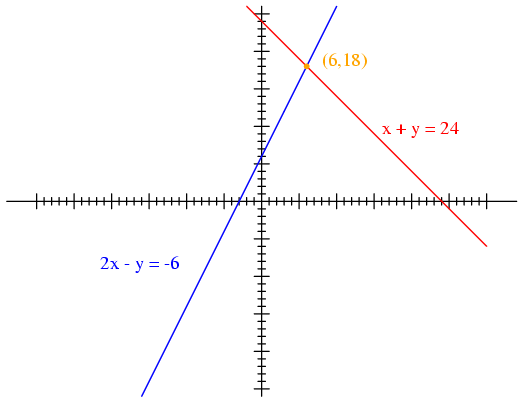 There is only one point where the two linear functions x + y = 24 and 2x - y = -6 intersect (where one of their many independent solutions happen to work for both equations), and that is where x is equal to a value of 6 and y is equal to a value of 18. Usually, though, graphing is not a very efficient way to determine the simultaneous solution set for two or more equations. It is especially impractical for systems of three or more variables. In a three-variable system, for example, the solution would be found by the point intersection of three planes in a three-dimensional coordinate space -- not an easy scenario to visualize. 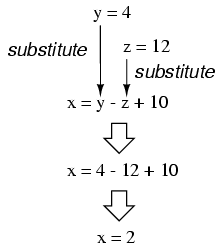 Applying the substitution method to systems of three or more variables involves a similar pattern, only with more work involved. This is generally true for any method of solution: the number of steps required for obtaining solutions increases rapidly with each additional variable in the system. In closing, we've found values for x, y, and z of 2, 4, and 12, respectively, that satisfy all three equations. 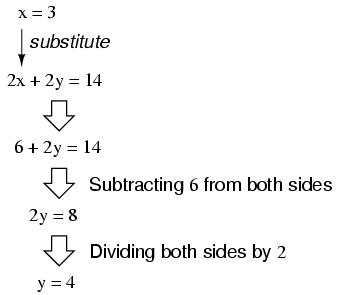 While the substitution method may be the easiest to grasp on a conceptual level, there are other methods of solution available to us. One such method is the so-called addition method, whereby equations are added to one another for the purpose of canceling variable terms. 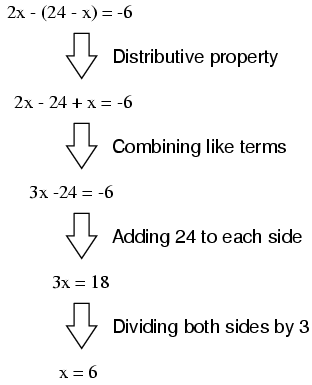 One of the most-used rules of algebra is that you may perform any arithmetic operation you wish to an equation so long as you do it equally to both sides. With reference to addition, this means we may add any quantity we wish to both sides of an equation -- so long as it's the same quantity -- without altering the truth of the equation. The resulting equation still contains two unknown variables, just like the original equations do, and so we're no further along in obtaining a solution. 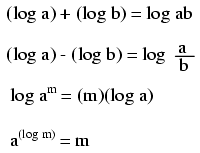 However, what if we could manipulate one of the equations so as to have a negative term that would cancel the respective term in the other equation when added? Then, the system would reduce to a single equation with a single unknown variable just as with the last (fortuitous) example. 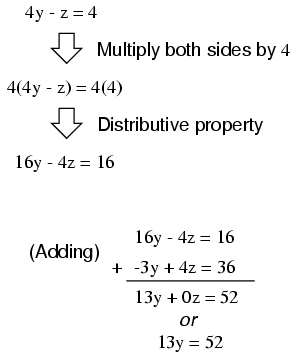 Taking the new equation 13y = 52 and solving for y (by dividing both sides by 13), we get a value of 4 for y. 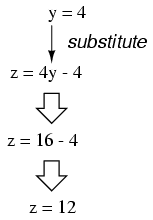 Substituting this value of 4 for y in either of the two-variable equations allows us to solve for z. 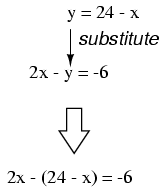 Substituting both values of y and z into any one of the original, three-variable equations allows us to solve for x. 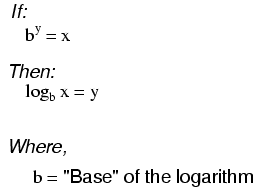 The final result (I'll spare you the algebraic steps, since you should be familiar with them by now!) is that x = 2, y = 4, and z = 12.